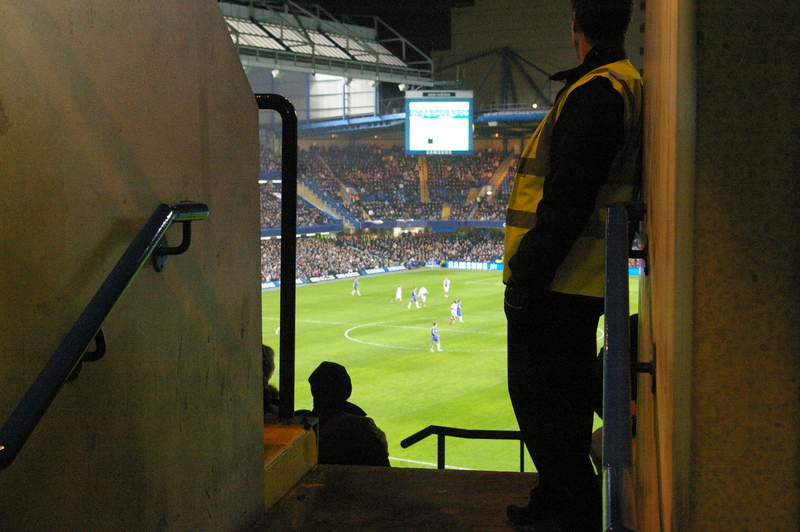 Chelsea vs. Birmingham City : 27 January 2010. I was able to get away from work at 4.15pm.The first part of the journey, maybe until Swindon, was spent running through the up-coming games with Parky…who is doing what, travel plans for Arsenal and Cardiff, tickets for Wolves, tickets for various friends for the games against Cardiff City, Arsenal, West Ham and Inter…I think my brain was frying at the thought of it all. I think I need to set up a spreadsheet ( with monies in and out ) to keep on top of it all. I’ll have a word with my personal IT department! The traffic was reasonable and with Parky yakking constantly, the time flew. We reached a packed Goose at 6.45pm and Wes was at the bar to meet us. Monies changed hands, beers were bought. We trotted down to join the rest of the boys. I spent a few minutes chatting with my mate Russ – originally from Frome, now in London – who we took to his first ever game at The Bridge back in 1994. He is off to Toronto, Boston and NYC with his wife in April and I lent him a few guide books. We spoke of America – he has tickets for Fenway – but also of the game against Birmingham. As we walked down the North End Road, we both commented that this could be a pivotal game on our season…a great chance to make a statement and reclaim our position at the top. Wes sat with me in Glenn’s seat – his first game from the Matthew Harding Upper. We unfortunately missed the first couple of minutes. I noted that our visitors had gone Dutch on us and were sporting an Ajax kit. I looked around and took it all in. I always try and take in the whole picture. Birmingham only had around 700 fans. There were gaps again in the central ( comps? ) Shed Upper. There was a large “German Blues” flag draped over The Shed balcony. I quickly spotted that all of the supporters clubs banners were missing from the East Stand…they had been moved to the higher of the two balconies in the West. I wondered why. I think I sussed it. I spotted the seven Chelsea Pensioners sitting in their usual seats in the East Middle…above them was the plain white banner from Remembrance Day and I presumed that this would now be permanently placed above the Pensioners, with no other banners on show in the East, to highlight it. If so, I approve – a correct decision. After five minutes, Joe Cole courageously advanced down the right, fighting off challengers, before chipping a fantastic ball into the six yard box. It had tons of back spin and “sat up” beautifully for Malouda to head home. Get in you beauty. Hugs with Alan and Wes. We passed the ball around nicely, with Joe Cole very involved. Deco was playing in the holding role and, to be fair, did pretty well. He even made a few timely tackles and Alan dubbed him “Decolele.” I like it…Claude Decolele. The City fans sang about themselves “supporting their local team.” Another silly song in my opinion. What does it matter where people live in relation to their chosen team? As long as they “go”, as long as they get involved and support. Then a shock down at the Matthew Harding end, with a deflected shot spinning past our goal. It was the only real chance our visitors had on our goal in the first period. Riccy hit the base of the post with a header. Then a move found Lampard about twenty-five yards out. He looked up and quickly struck a laser into the Birmingham goal. I was right behind its trajectory and tracked it all of the way. What a lovely goal. More hugs and “high fives.” We had played well in the first-period. Frank seemed to be playing quite deep, but he chased everything. I couldn’t help but note that the crowed was desperately quiet. Wes, Alan and myself did our best, but it seems that the legendary Chelsea support is dieing on its feet. At half-time, I shot Tommy Langley. With my camera – he was on the pitch with Neil Barnett. His first goal for us came against Birmingham some 35 years ago. In the second half, more of the same. I noted how much ground Ashley Cole covers in a game. Watch him – he is constant motion, up and down that flank. Anelka was in good form, roving like a lone gunslinger, rarely losing the ball. The movement was good. Joe Cole, despite a promising start, was a bit disappointing really. He seemed to lose control too often and some of his final balls were Gronkjaeresque. JT attempted an outrageous over-head kick from a corner. I can still hear the dead thump as it hit his shin-guard. I think the ball is still up in the air. There were groans when we heard United had eased ahead of City in the League Cup. But – better news! – Arsenal were drawing at Villa and so we were top on points. It was a great feeling, sadly not shared by many in the 41,000 crowd, who were still deadly silent. I commented to Wes that the West Stand had not uttered a single song the entire game. A chance close in from Malouda was blocked by Hart, so impressive at St. Andrews. The visitors quickly broke, but McFadden screwed the ball wide. Our play was getting a little more ragged and JT gave the ball away cheaply, but Cech saved superbly. I do not remember any other attempts on our goal. However, at 2-0, I still feared us letting in a goal. I guess that’s the Chelsea fan in me. I think Wes wasn’t so worried, the fool! Just after another Malouda shot was flashed wide, we scored again. Thankfully, I snapped just as Frank swept the ball in with his left foot. Again, I like the look of Zhirkov. I’d give the Man Of The Match award to Anelka, though. He was always involved. With the game coming to an end, with five minutes to go, I was dismayed to see thousands of empty blue seats throughout the stadium. Oh dear. We had gone top and yet it seemed that 20% of the fans did not want to celebrate with the team at the game’s conclusion. I always stay to the end. Leaving early is a sign of weakness. We should be there till the referee blows. If nothing else, it gives other clubs fans an easy excuse to wheel out the old clichés about our support being aloof and fickle. A football club is not just the players on the pitch. It includes the supporters too. I can’t stress that enough. Hate using the word, but we need to be united. We heard that the Goons had only drawn up in Birmingham. Excellent. Wes and myself made our way out onto the Fulham Road. The So Bar was full of song and we met up with Parky. Wes is yet to witness a Chelsea loss on his year long sabbatical in the UK and let’s hope for this to continue. We peered into The Goose to see that United had won 3-1. Poor old City. Parky and myself popped into The Lily Tandoori for an hour and celebrated Chelsea’s win with a curry. It was a lovely end to the evening. A family in the adjacent booth were United fans from Chelsea and we exchanged friendly barbs. Chelsea fans from Somerset and Wiltshire, Manchester United fans from Chelsea. What does it all mean? I drove back west, eventually reaching my village at 1.45am. Top of the league. Lovely. This entry was posted in Season 2009-2010. and tagged 2009-2010, Deco, Pubs, Tommy Langley by Chris Axon. Bookmark the permalink.